I have entered into a short natural gas trade. The time frame is short term, a few days. I entered the trade at 11:42 this morning, my time, at a price of 3.40. 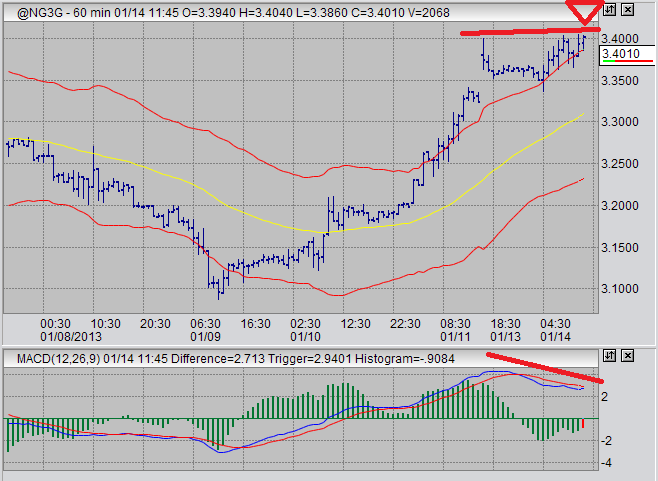 The principles behind the trade are an MACD divergence on the 60 minute time frame. There seems to be a lot of bullish sentiment for natural gas these days. We some people predicting "serious cold" for a couple of days here and there. We've also seen some pretty sharp drops in natural gas supply figures provided by the EIA over the past few weeks. One of the reasons I used to stay away from natural gas was that the past couple of years I tried trading it based on the numbers and the weather. In my experience, this is extremely unreliable. I know trade this market primarily based on technical analysis. If the EIA numbers and cold forecasts align with the technical analysis, its good. But if the technical analysis is in direct contradiction with cold weather forecasts or the EIA numbers, in my experience, the technical analysis wins every time the natural gas market. Don't ask me why. Let us observe a chart for February natural gas futures on the 60 minute chart. What we see here is prices encountering resistance at 3.40. Meanwhile, as prices poke upwards against the glass ceiling, MACD has made a very nice divergence. I have decided to make a short natural gas trade because of this situation. In case I'm wrong with my analysis, or in case of sudden market affecting events, I have placed a stop order to limit my potential exposure to loss. I'm still long gold from my Dec 28 trade. I am seeing a potential buy in the USDX on the 60 minute time frame, but I am not going to enter a trade in that market right now. I am still looking with a bullish eye towards sugar.